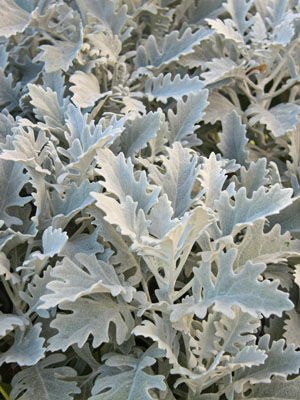 Dusty miller tolerates light frost with ease, but can be damaged by hard freezes. Where winters are mild, dusty miller can be grown as a winter annual or short-lived perennial. Petunia and Verbena. The luminous silvery leaves of dusty miller make it a valuable neutral plant for separating bright colors, or framing showy shrubs like roses. Dwarf types make good edging plants for beds and containers. Sow tiny dusty miller seeds atop moist seed starting mix and gently press them into the surface. Most gardeners buy dusty miller seedlings, which are widely available as bedding plants. Allow 12 inches (30cm) between tall varieties such as ‘Silver Lace’. Dusty miller plants that survive winter produce clusters of small yellow flowers in spring. The flowers are usually clipped off to encourage the plants to develop new leaves. The light-catching gray foliage of dusty miller makes it a good choice for areas used in the evening. Snip off blossoms and old leaves to keep plants looking neat. In fall, gather and dry perfect leaves before the plants are damaged by freezing weather. Too much water or very high humidity can occasionally lead to problems with diseases.